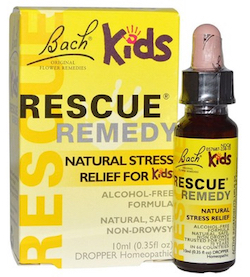 Children's Rescue Remedy an alcohol-free formula in a child-safe plastic bottle and dropper created to help children during times of stress and anxiety. Safe, gentle, non-drowsy, alcohol-free formula. Directions: Take 4 drops directly on the tongue or 4 drops in water and sip at intervals. Repeat as necessary. Store below 77 degrees farenheit (25 degrees Celsius). Safety Information: Warning: Keep out of reach of children. If pregnant or breast-feeding, consult your health practitioner before use. Do not use if the tamper evident seal is broken. Ingredients: Active Ingredients: Each 5X (HPUS) - Ornithogalum umbellatum, clematis vitalba, impatiens glandulifera, and prunus cerasifera. Active Ingredients made according to the Homeopathic Pharmacopoeia of the United States (HPUS). Inactive Ingredients: 80% glycerine, 20% water.